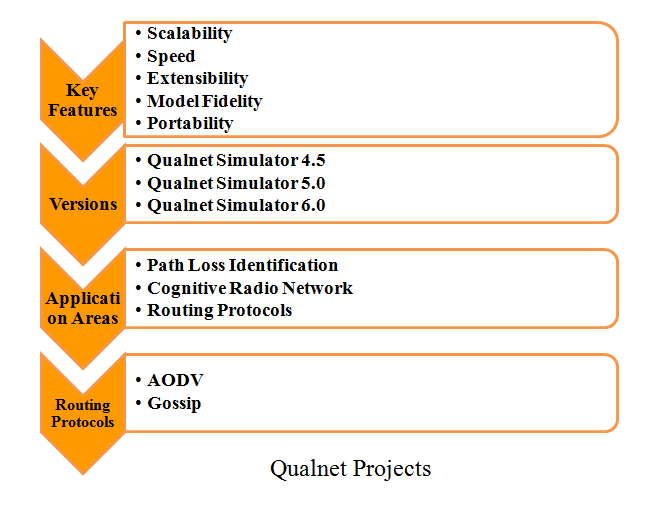 QUALNET Projects is a simulator which basically designed for wireless, wired and mixed platform network. We support students to implement QUALNET in large wide network and distributed applications. We deployed QUALNET in more than 95+ projects to create an environment and animate various network scenarios, protocol design and performance analysis. We implement QUALNET project code in C++ language and our team runs QUALNET simulation on various operating systems such as windows, Linux and UNIX. It used for heterogeneous hardware components. QUALNET commands to control several elements during execution. Physical terrain occurred with various communications which take places are DEM, DTED and Urban. It provides Icons and other features which depict elements. Enable a mechanism between various simulator (or) external systems. We implement a QUALNET simulation platform for planning, testing, and training for the behavior of network communication based on various journals as Elsevier and more reference papers. We develop and manage network system with QUALNET in a cost effective way. Composed of log normal shadowing model, two ray model, free space model and fading models. It provides various models are Random waypoint mobility model, File based mobility model and group mobility model. It includes precise residual life estimator, linear model and service life estimator. Support various antenna models are steerable antenna model, Omni directional antenna model and switched beam model. Composed of generic Radio energy model, MICA Z, Mica motes radio energy model, Radio specific energy model. 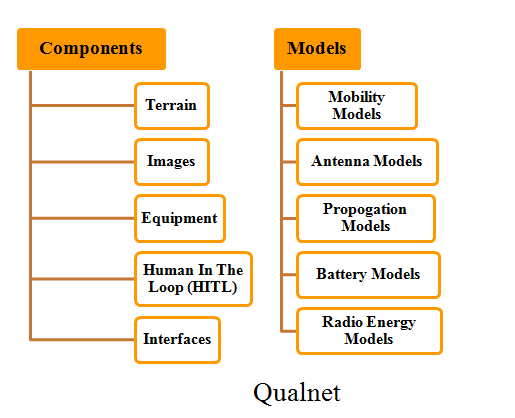 QUALNET is a full set of simulation tool for modeling networks. We use QUALNET simulation and emulation process to estimate network performance to improve design, operation and management. Various models are developed by user for the simulation of networks. Connect various software and hardware applications such as STK, OTB and real networks. QUALNET run on various platforms such as distributed and cluster architecture, 23-bit and 24-bit computing platforms, windows. New protocol models are developed. We support various applications and it is easily deployed in QUALNET by our team. QUALNET is distributed system and students are more focused on to do projects in QUALNET which is easy to implement.